Monrovia – Magararet Cooper Frank, Assistant Minister for the Department of Culture at the Ministry of Information Culture and Tourism, has promised to do everything possible to improve the various culture centers across the country. Minister Cooper, who is the wife of the Liberian movie star Artus Frank, made the remarks during her induction ceremony at the ministry on Wednesday, October 10, 2018. Madam Frank has had a long experience in the area of culture. With a rich cultural background, she has preformed cultural dances for several years before adventuring into the film industry. 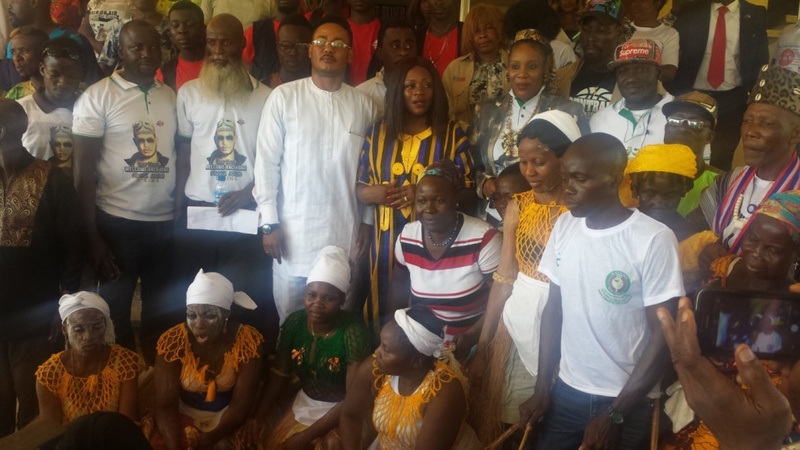 With many of the country’s cultural centers dormant, the Assistant Minister for Culture told a gathering comprises of her husband, the Liberia National Culture troop and some artists of the Liberia Movie Union that she has come to revamp the culture sector of Liberia. Giving the four areas she would tackle, the Assistant Minister promised to collaborate with other Agencies and Line Ministries to organize Annual Inter-Counties Cultural Competitions. “We believe that this cultural competition will help with the unification of our country and also help to showcase the talents Liberians have to our international counterparts,” Madam Frank said. Going forward, the Assistant Minister, said her department will also embark on plans to host an inter-school cultural competition, adding that it is intended to raise the interest of students in the area of culture. She also promised to work tirelessly to renovate the Kendeja in Ben’s Town, Marshall Highway and other culture centers across country. “This National Culture Center is our heritage; we will therefore do everything in our powers by soliciting support from National and international partners in order to improve it. We will also include the Behsao Culture Village in this plan,” she said. Frank further that her department is going to work with the Ministry of Education in an effort to train teachers that will teach the culture of Liberia in the various schools. “Although cultural studies are provided in the National Curriculum; we need the requisite instructors to impact the knowledge to our kids,” she suggested, adding that the 8th UNESCO cultural convention needs to be ratified by the Liberian government to protect the cultural properties of the country.